The quote on the back of this t-shirt is by a Greek woman that saved a refugee from drowning in the ocean. She received thanks from people all over the world, but she said that she doesn’t think she did anything out of the ordinary and would hope that everyone else would have done the same thing. In contrast to the man that allowed over 70 refugees to suffocate in the back of his truck, I think she is amazing and I, too, wish that everyone in the world were like her. Making a statement. Be humane. If you’ve been watching the news reports about refugees scattering all across the world, seeking safety, you have undoubtedly seen a mixed bag of reactions to their migration. Some countries have build barriers to keep them out, while others have welcomed them in; some people have taken advantage of them and even attacked them, while others have fed them and given them shelter. The quote on the back of this t-shirt is by a Greek woman that saved a refugee from drowning in the ocean. She received thanks from people all over the world, but she said that she doesn’t think she did anything out of the ordinary and would hope that everyone else would have done the same thing. In contrast to the man that allowed over 70 refugees to suffocate in the back of his truck, I think she is amazing and I, too, wish that everyone in the world were like her. A link to a news clip with her interview is below. Her words at the end are the most moving. 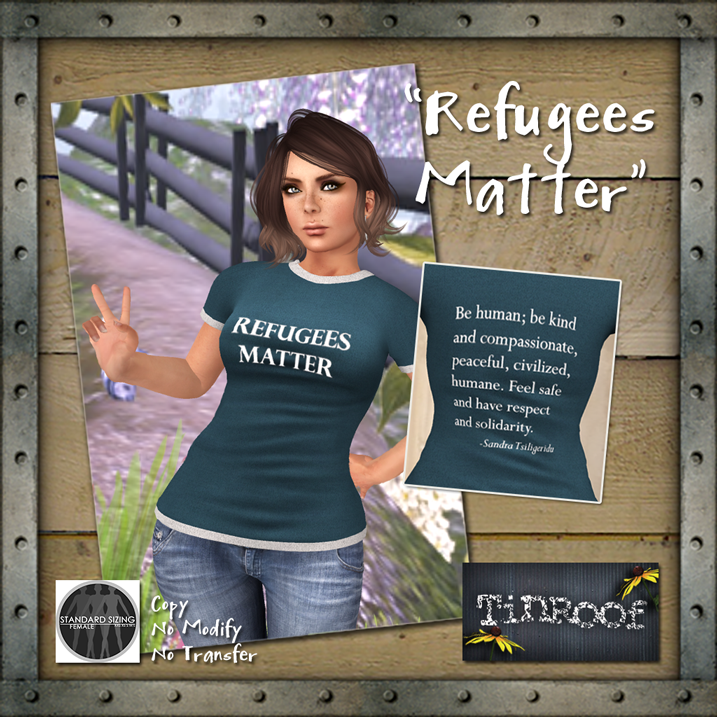 Three colors of this t-shirt are available for free at my in-world store, on marketplace, and in the TGIF section outside Blacklace. The vendors may request 1L but then they return it to you afterwards. If they do not, please let me know. The shirts are mesh in standard sizes and I am wearing it over the Maitreya Lara mesh body in the photo.